This is why I love Jackie Silberg’s book 500 Five Minute Games. Quick and Easy Activities For 3-6 Year Olds. Silberg’s book is great for preschool teachers, but also for moms and dads who tire easily of young children’s games and toys. 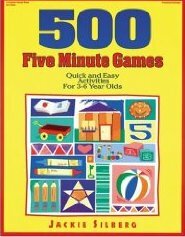 Before getting this book I often felt tempted to pick up the phone or put on a movie when my preschooler’s games got repetitive. There’s only so many times in a day you can sincerely answer yes to “Wanna play hippos?”. Mom: I was going to a park one day and what do you think I saw? Mom: And what was the hippo doing? Mom: And who was with the hippo? Mom: And what did the hippo and pony do after they ate the cake? Child: They ate dinner! It was backwards day. Can you see how this gives us a break from hippos and ponies? We use “the park game” in the car a lot when we’re waiting for Daddy. One of my favourites is called “Speak with Your Body” and comes from the Active Games section. The children have to answer your questions with a body part other than their head. Do you like to eat worms? (Child shakes elbows no). Younger siblings can take part in many of these games (no chokable parts) as my two year old can attest. Giggles abound. Another fun game is “Body Crayons”. The children are the the crayons and the floor is the paper. Does it get any more eco-friendly than that? Silberg’s book not only rescues parents from repetitive preschoool play, it teaches creative thinking to our youngest learners. And as we all know, it is criticial that we raise imaginative thinkers to help keep this planet spinning. This looks great! I’m hopping over to see if I can get it on Amazon (wish list for the holidays!). Thanks for the review – I’m always on the lookout for new stuff to do with my kiddos, especially since winter is fast approaching and a lot of my “good ideas” are outdoor activities. You’ll love it, then. Many of the activities get the kids moving around. I believe my husband bought it off Amazon for me last Christmas. One of his coolest gift ideas!